Limit 1 per person and 1 per family. Valid on any regularly priced merchandise. Promotional value expires 60 days from purchase. Put on your magic hat and spruce up your tricks with 50% off magic shop items at Ash's Magic Shop in Ravenswood ($10 value). This well-established business provides a wide variety of magic tricks, practical jokes, costumes, books and more for the magician in all of us. Mr. Ash has been performing magic for more than 30 years. His passion for magic is seen in the shop's endearing array of items, including collectibles and historical items that Mr. Ash has collected over the years. You can find everything from card tricks and foam balls to whoopee cushions and wigs. Ash's Magic Shop also offers magic shows for birthday parties, weddings and other celebrations. 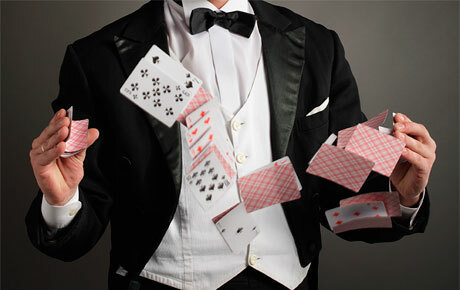 Experienced magicians, clowns, belly dancers and more are also available to liven up your next event.